The Marianas Open went down in beautiful Mangilao, Guam. There was $20,000 at stake, and some of the world's most talented jiu-jitsu fighters were on hand with hopes of dethroning the two returning champions. But it would not be the challenger's day. After besting Josh 'Wu' Jerome and Tanner Rice in the opening rounds, Felipe Pena met Checkmat representative Jackson Sousa in the final. Sousa, seemingly drained from his two previous battles with Mahamed Aly and Felipe Trovo, appeared to gas early in the match and was unable to recover a strong defensive position after an early onslaught from Pena. The 181lb division final was a tightly contested scrap between Isaque Bahiense and Renato Canuto. The duo had several intense scrambles, but somehow Bahiense always seemed to get the upper-hand. For his part, Canuto was exceptionally close to sweeping Bahiense off his powerful base but was unable to secure the points. Bahiense took the match, belt – and the $10,000 – by a lone advantage. Masahiro Iwasaki has proven that he's a force to be reckoned with. He took out Gilbert Burns and Servio Tulio on his route the bronze medal in the 181lb division. Iwasaki is for real, and he is not one to be slept on. Servio Tulio looked fantastic in his first major gi tournament as a black belt. 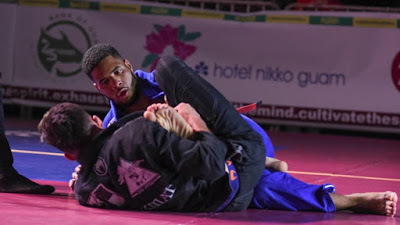 He beat Atos veteran Michael Liera Jr. in his opening round and went on to battle Renato Canuto and Iwasaki in very close matches.